One of my favorite pictures from my visit in 2009. Across the bridge to my left is a wonderful tea house. Excellent cup of tea and scone with cream and jam. I was too nervous to take photos “publicly” so I don’t have any from inside. As I recall now, though, there may have been a sign that said no photos, but I don’t precisely remember. I was very conscious of not being a typical tourist, but I’m not sure that if I went back that I would care about that. I love taking and looking at photographs. I love the view through the lens. Behind me is a circle of standing stones. At the time I thought they were ancient stones and I gave them that reverence. When I arrived home, I did some research and discovered that those stones were placed there to commemorate the 1951 Eisteddfod. Fun fact: my friend’s grandfather won the crown at that year’s competition. He was a well respected and well known broadcaster for television and radio. On the river you can see two swans, who were happy to pose for my other pictures. 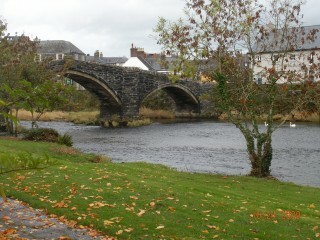 Another fun fact: This bridge is said to be one of the ones designed by Inigo Jones.